Breakfast is undoubtedly the most important meal of the day and having a good meal before starting your day can make all the difference. 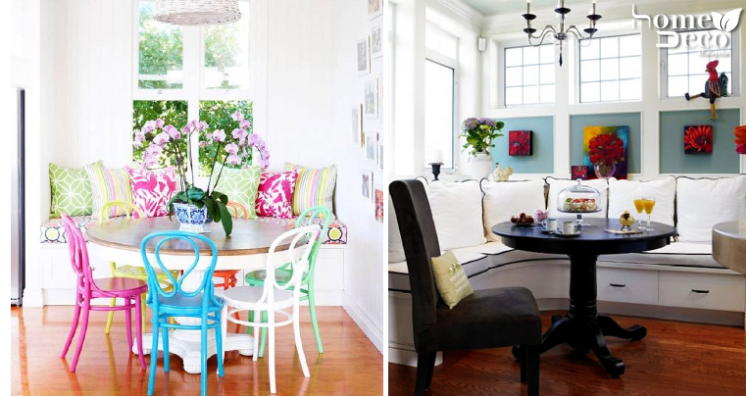 Enjoying your breakfast in a cosy and lovely nook in your home is a great idea that will make all your morning blues go away so here are some styles you can emulate. Of course, you can eat your other meals in your breakfast corner as well so by all means, decorate it to look pleasing to the eye and suitable for any other occasions as well. This gorgeous nook has some vintage-inspired designs that will ensure you have an enjoyable meal. This quirky breakfast corner is simply teeming with hipster vibes especially with that cool table and also the chalkboard wall. The best thing is that you can personalise the chalkboard wall any way you want so you always have something fresh to see when you are eating your breakfast. Make your breakfast nook look elegant and posh with some luxe textures and pretty flowers so that you can eat your meal in beautiful surroundings. The chandelier adds a nice touch of glam as well. For people who love green, this is the ultimate breakfast nook that you need at home. Adorned in wonderful shades of green and complemented with white to tone it down, you won’t go wrong if green is your favourite colour. For the bachelor or just the young couple who is living alone, if you want a fuss-free corner than you should definitely go for this. Although it may look like it’s nothing much, the quirky and modern chairs keep it from being too boring. There’s nothing more fun and cheerful than adding a splash of colour to your breakfast nook and it certainly livens things up. The colourful patterns on the pillows at the seating helps to keep the decor interesting.